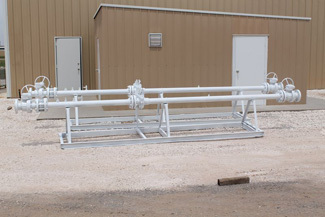 At Energy Meter Systems, we are recognized leaders in the manufacturing of natural gas measuring equipment, offering high quality meter tubes made from the finest meter tube piping available. Honed or D.O.M. piping is utilized, suitable for gas and liquid service. Meter tubes sizes range from 2" to 24", designed using all major brands of orifice fittings. All piping conforms to the latest specifications as mandated by the American Gas Association's Gas Measurement Committee Report No. 3, with the internal finishing exceeding their requirements. Our orifice fittings are built to the API 14.3 standard, welded by code qualified welders for the ensured quality of each unit.